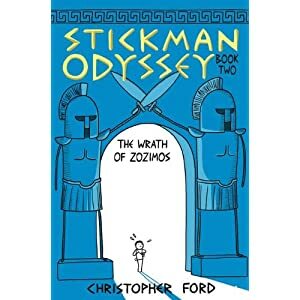 I wasn’t sure what to expect with The Stickman Odyssey, although I seem to remember a long time back seeing some of the frames by writer/illustrator Christopher Ford at his online site. I thought it would be yet another retelling of The Odyssey, which I can certainly live with but there often seems to be a lot of them out there. Ford takes his stories, told in characters who are little more than stick figures, in directions that echoes the ancient texts but keeps an original storyline going. With lots of humor and character. In brief, the story in the two books (Book 1 and Book 2, The Wrath of Zozimos) is about the main protagonist hero — Zozimos — who is an exiled prince who seeks to return home to retake his lands. But of course, there are all sorts of adventures and mythical creatures and obstacles in his path. He hooks up with a band of friends, with various strengths and weaknesses and stories unfolding of their own, and Ford weaves an epic tapestry of comic art here in The Stickman Odyssey. 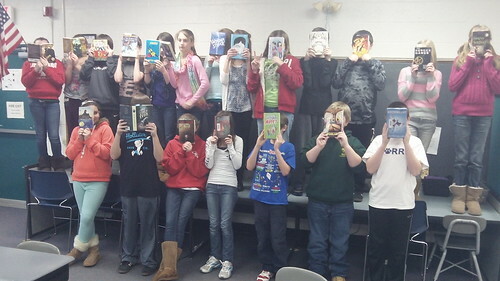 The books really do honor the myths while building on them with humor and invention. Ford is able to this because he pays attention to character development, which you sort of have to do when everyone is a stick figure (the books are subtitled: An Epic Doodle). He imbues the characters with identity, and those weakness and strengths of character carry the plots along at a quick pace. 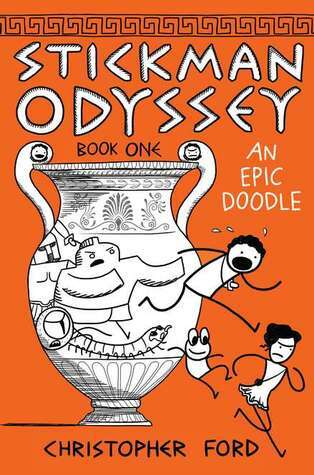 I enjoyed The Stickman Odyssey stories, but I had trouble finding the books in my house, as my three sons were also reading and enjoying the stories, too. By the way, we all agreed that the second book was a bit more exciting than the first book, but it may be that we got to know the characters a bit at that point. This is part of an ongoing discussion across digital platforms, about digital writing, that I am having with my friend, Anna Smith at the National Writing Project’s Digital Is site. So far, we’ve exchanged video talks, and then screencasts, and now, I am inviting her to create a webcomic via Dan’s Awesome Ragemaker Comic. The topic? 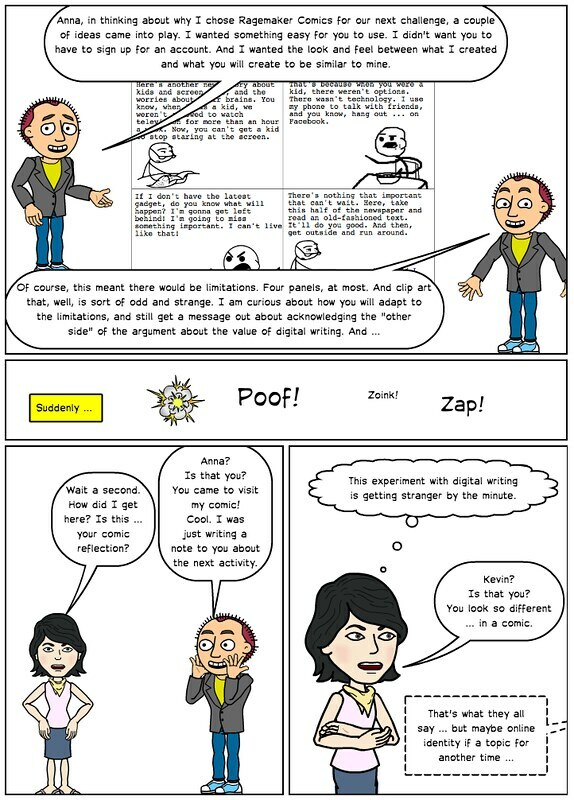 How do we acknowledge the opposite view of our discussions: the fear that digital writing is not unique, or that it is bad for our students to be composing with digital tools and spending time on digital spaces? This stems from a long discussion I had with a parent the other day, who supported my work with technology but expressed worries, too. Those concerns echoed ones I have as a parent, too. And as has been my custom, I created a webcomic reflection, with a little twist. I created Anna as a character and added her into my comic. I am hoping she is OK with that (I’m pretty certain she will be) and it will give me a chance in the future to do more reflections my talking to “her” in my webcomics. Let’s here it for the fans of old libraries, the mysteries of books, and the intersections of old and new technology! Booya! Writer Robin Sloan has woven these elements together in his debut novel, Mr. Penumbra’s 24-Hour Bookstore, in a wonderful way that mostly keeps the pace and interest going (although the ending is a bit of a letdown). The story revolves around the narrator, Clay Jannon, who is skirting on the edges of the web design business in San Francisco when he takes a job as a clerk at an old bookstore. It’s an odd place, built more vertical than horizontal, with shelves reaching up high into the air. And while the place has only a few customers each day, the regulars are an odd sort, who return and take out ancient texts from deep and high in the shelves — books that seem undecipherable to Clay, until he discovers a secret society and enlists his new girlfriend, a woman who works at Google, to help him break an ancient code and discover what the society — and his bookstore boss, Mr. Penumbra, a kind man with a heart like Yoda — has been seeking. With a mix of humor and acknowledgement of the programming power of Google, plus a love of old books, Sloan has crafted a fun and engaging story that mostly holds together. This is a book for the hands of friends who love old bookstores and books, and I have just the right person in mind, too. He used to work at a bookstore, and loves a good mystery. If you are that kind of person, then check out Mr. Penumbra’s 24-Hour Bookstore. Prepare to be pleasantly engaged and entertained. 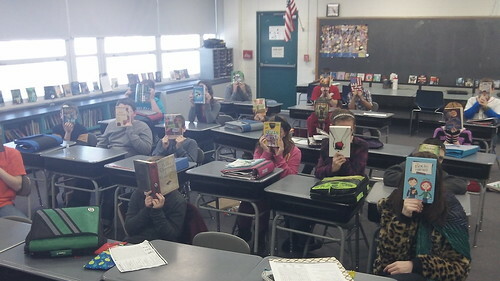 My students are in the midst of reading a wide range of books to start the year, and we created this audio collage of the “first lines” of their books. I love how the words and ideas come together with their voices. Anna Smith and I are in the midst of a “digital conversation” about digital writing. Most of this is taking place at the National Writing Project’s Digital Is site, but I am also sharing my end of the activities here. We’re moving across platforms and strategies as part of our conversation, and adding a reflective piece to our role as writer/composer. Here is a student who really “got it” when it came to game design. Sure, the game is a bit long (and he worries about that) but the challenges and puzzles built into the gameplay were far more advanced than other students were doing. 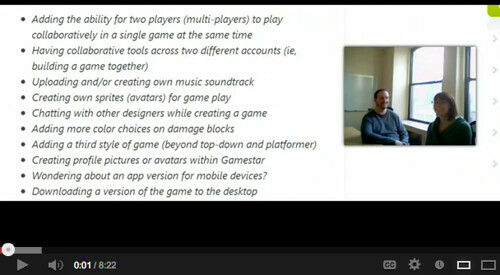 I see him as someone who has the interest and talent for future game design work. “They read our comments? They’re talking to us? Here? In Southampton?” — a student. As part of the writing component to our video game design project, students wrote a collective letter to Gamestar Mechanic to provide user feedback and offer up suggestions for the site. Yesterday, I shared with them a video response put together by Brian and Katya, from Gamestar Mechanic, in which they went through each of the main points. 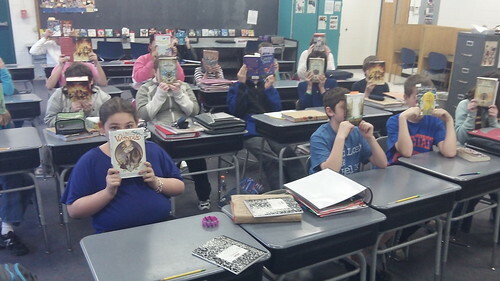 My students were so excited that someone had not only read their comments but were offering a response back to them. The video is about 8 minutes long (and private, so I won’t be sharing it) and my students were rapt and attentive as they listened to Katya and Brian chat with them, via a video screencast. It was a real case of authentic writing for authentic audience, and it reminded me again how powerful that experience can be for young writers. Here, they were making a case for improving a game design site, and their suggestions were being listened to, considered and possibly even put into action in the future. Thank you, Gamestar, for taking the time to interact with my students, to read their writing, to be part of the learning experience outside of the site itself. I appreciate it. And so did they. 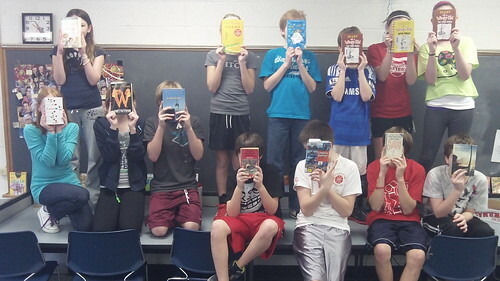 Prolific writer James Patterson and friends are at it again. First, they (Patterson, along with illustrator Laura Park and writer Chris Tebbetts) put out the two Middle School (Worst Years of my Life) series that combine angst about surviving middle school with comedic, graphic-novel drawings and the wild imagination of its main character (Rafe), and now they have put out I Funny about angst in middle school peppered with humor and graphic drawings. (This time, Patterson hooked up with writer Chris Gragenstein but kept on Park.) Actually, I was initially thinking this was just the third book in the earlier series but that is not the case. 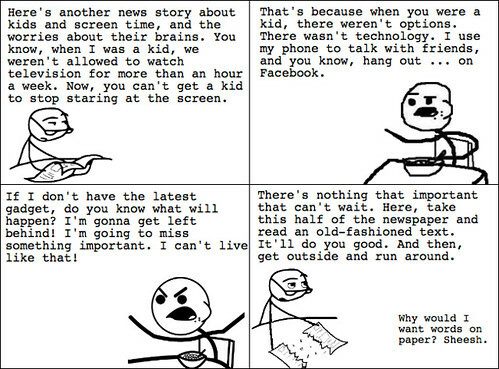 I Funny is its own story. Here, the narrator is Jamie Grimm, a wheelchair-bound middle schooler who yearns to be funny. As in, as a stand-up comic. 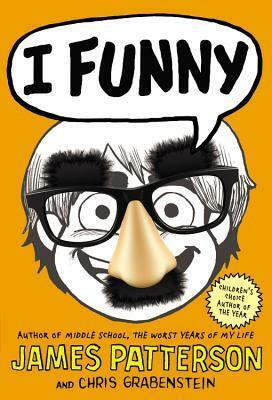 Humor has become Jamie’s weapon against the realities of life, and we don’t learn why he is in the wheelchair until the very end of the book, when he finally confesses to a friend the whole story of the tragic accident that not only cost him use of his legs, but also ended up killing his entire immediate family. He now lives with his adoptive relatives, and life is difficult, to say the least. I liked how the book puts Jamie’s physical and emotional struggles front and center, but in particular, Patterson and company really humanize Jamie as he struggles for some sense of normalcy in a life torn asunder by tragedy. It was also wise to have a new friend who sets time limits on Jamie for talking without joking, so that honesty and emotion is part of their friendship and relationship. Jamie is so wrapped up in his armor of humor that he has trouble relating to the real world. His entry into a stand-up comedian contest opens up doors for him, and gives him new confidence, but he also has come to come to terms with his life and his wheel-chair bound world. The narrative arc here closely resembles the other two middle school books — a boy character dealing with a difficult situation that only comes to light late in the book. The illustrations by Park are funny, and complimentary to the story, and the plot is brisk in I Funny. What it lacks is a certain depth, although it certainly hints at that when Jamie finally tells his story to his new friend. There is an emotional wallop to the moment that we, the reader, feel, as does Jamie. My middle school son really liked this book, and I suspect a few of the boys in my class will also find it interesting. (and I am sure they will be attracted to the cover design.) thought it was fine, but not great, mainly because it felt too much like old, familiar terrain. Jamie seems like a cousin to Rafe, the main character in the other middle school stories by Patterson. (or, I wonder, is that because Park illustrated both? Am I being swayed by the art more than the story? Possibly).